The choice of title will probably betray my addiction to the nineteenth-century press, but taking advantage of the benevolence of my colleagues I decided to put research into practice and revive some of the conventions of Victorian journalism on our own blog. I learned to treasure this word, “Ourselves”, very early on in my research. Its sudden appearance on a yellow-tinged page always held the promise of some important discovery to be made about one aspect of the press world or the other: Was business going well or was the journal struggling? Had the post office failed, once again, to deliver the newspaper to its subscribers? Was the editor going to reveal precious information about the circulation and readership of his paper? Or was he simply letting the world know that he had decided to throw away his editorial pen, frustrated by the lack of public and official patronage? (Before you ask, yes, most of the editors I dealt with were men…) Thankfully, the news I would like to share today is much more cheerful. Those who, like me, have spent countless hours sifting through Indian and British newspapers and periodicals will have already guessed that what follows is a brief report of our own project activities. Last weekend provided us with an exciting opportunity to introduce our research projects to a slightly different audience than the one we usually interact with: the ladies and gentlemen who participated in Meeting Minds, a series of activities organized by the University of Oxford as part of its Alumni Weekend 2014. This was the eighth event of this kind organized in Oxford and followed two similar meetings which took place earlier this year in Hong Kong and New York. St Anne’s College, where our project is based, greeted its alumni with a medley of activities which included, among others, a writers’ showcase and a seminar on the past and future of the printed word. We are grateful to our Principal, Tim Gardam, for inviting us to take part in this event, and especially to the audience, for cheerfully foregoing the sunny, beautiful autumn morning and joining us for an hour-long discussion on “Diseases of Modern Life: Stress, Strain and Overload in the Nineteenth Century”. Their enthusiasm for our project, reflected in the questions and the discussion that followed, was particularly encouraging and generous! The seminar began with our principal investigator, Prof. Sally Shuttleworth, introducing our research projects and highlighting the contemporary relevance of the topic we study. Stress, information overload and the long-hours culture, Sally argued, are by no means phenomena confined to the contemporary world. Just like today, Victorian experiences of modernity—of the “difference posed by the present”, as Partha Chatterjee wrote in his discussion of Kant’s work on Enlightenment—were equally infused with concerns about physical and mental wellbeing, about air and sound pollution, over-sensory stimulation and unhealthy work practices. Sally’s discussion of Benjamin Ward Richardson’s work revealed the contemporary resonances of his vision of Hygeia, the “City of Health”. Needless to say, all of us were particularly receptive to Victorian medical reformers’ suggestions that a six-month holiday is beneficial to a healthy and productive working life! The seminar continued with talks by postdoctoral researchers Amelia Bonea, Jennifer Wallis and Melissa Dickson, each of whom focused on a distinct but interrelated aspect of Victorian perceptions of health. 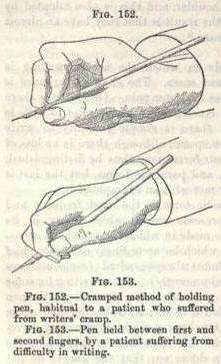 Amelia introduced the audience to a slightly different site of work than the ones usually studied by scholars of Victorian Britain: the office and the plethora of occupational hazards associated with it, among which were tuberculosis, “severe colds”, diseases of the digestive and circulatory systems, eye strain and fatigue, headaches, backaches and repetitive strain injuries such as writer’s cramp and telegraphist’s cramp. She discussed the changing aetiology and treatment options for these latter conditions, explaining how they were related to changes in workers’ compensation legislation in the late nineteenth and early twentieth century. 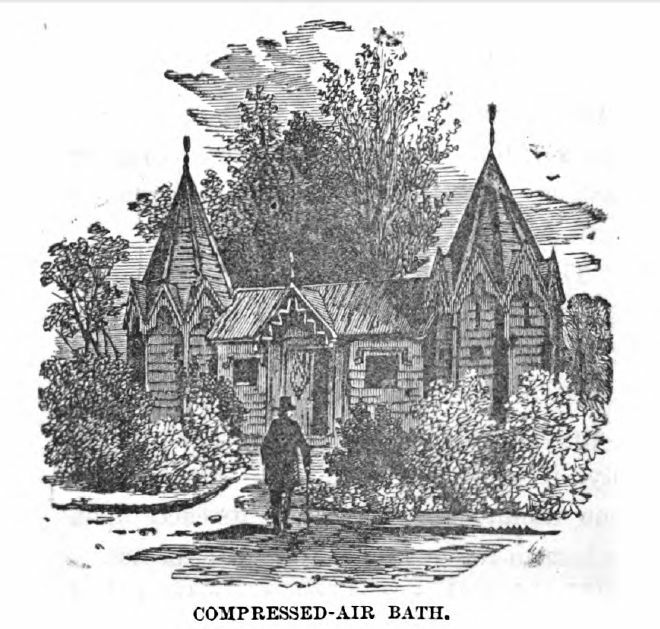 Jennifer’s talk took us back in time to mid-nineteenth century Ben Rhydding, a popular hydropathic establishment where, we discovered, Londoners could also experience the benefits of a compressed air bath. Such air baths were part of a transnational circuit of medical ideas and practices and enjoyed popularity in continental Europe as well, with Lyon and Zurich being some of the other notable centres of treatment. They were considered particularly beneficial in the treatment of lung diseases such as tuberculosis. Finally, Melissa’s talk drew attention to another aspect of nineteenth-century life and health: sound and its therapeutic properties. While most of the research conducted so far on Victorian cities has focused on sound pollution—the “nausea of noise”, as Melissa aptly put it in another post on this blog—her current research aims to show that sound had curative powers as well, for example in the treatment of psychiatric conditions. We all heaved a sigh of relief on hearing that the cat piano or Katzenklavier, that bizarre musical instrument which was envisaged as an effective tool in the treatment of psychiatric patients, was not eventually put into practice. For those of you who would like to find out more about our talks, the seminar will be made available shortly as a podcast at podcasts.ox.ac.uk. As always, we are very happy to hear from scholars and members of the public interested in similar research topics, so do get in touch with us via email or the comments section below. Partha Chatterjee, Our Modernity (Rotterdam: SEPHIS/CODESRIA, 1997). Earlier this year, Huffington Post writer Candace Davis asked whether ‘people-watching’ – sitting in the window of a café and analyzing passers-by – was an entirely harmless exercise. In an age of camera phones, youtube uploads, and Google Glass, it seems that the idea of what is acceptable behaviour towards strangers in public is being reconfigured. People-watching itself, though, isn’t – as Davis noted – a new phenomenon, and the desire to people-watch is certainly noticeable in the nineteenth century. The activity of promenading – taking a leisurely walk through a scenic or popular area – was more than simple physical activity, being a way for ladies and gentlemen turned out in their finest clothes to both see and be seen. Judith Walkowitz has highlighted how participating in public space had its darker side too, with street harassment an increasingly common occurrence for urban women in late Victorian London. This awareness of public space as an arena in which one’s behaviour and appearance were on show is beautifully captured by a series of mid nineteenth-century works by Albert Richard Smith, whose comic writing provides a fascinating window onto social attitudes of the day. Born in 1816, Smith followed in his father’s footsteps to become a surgeon. His literary endeavours rather seem to have eclipsed the medical, however: he contributed to Punch, set up his own magazine titled The Man in the Moon, and penned a popular account of his ascent of Mont Blanc that was turned into a stage show. His medical background showed through in many of his works. The humorous ‘Confessions of a Dissecting Room Porter’ series in the Medical Times and Gazette followed the fortunes of porter Jasper Buddle, whilst he transformed modern society into a kind of scientific space for observation in The Physiology of Evening Parties (1846) and The Natural History of the Gent (1847). 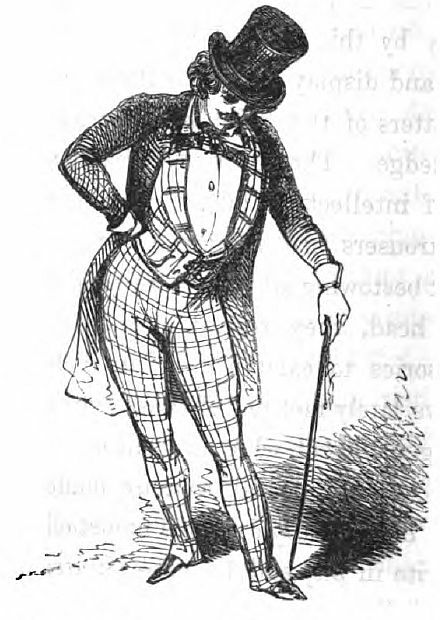 The Natural History of the Gent was one of a series of ‘social zoologies’ (as they were described by Smith) that could be scathing in their lampooning of contemporary social groups. Smith reserved his most furious contempt for the Gents, a group ‘of comparatively late creation’. ‘Social naturalists had overlooked [them]’, he said, yet they could be seen all over London. ‘[T]he finest specimens may be seen in the coloured “fashions”, with which certain comically-disposed tailors adorn their windows’, he wrote. The Gent thinks he is ‘rather the thing’, strutting around town like a peacock making useless loud remarks and harassing passing women. He emerges after dusk when his day’s work is completed, and his natural habitat is the theatre – though at certain times of the year he can be seen migrating, with other Gents, to Gravesend or Ramsgate. Subtly different to the Gent was the ‘Idler upon Town’, who was meticulously sub-divided into further categories in The Natural History of the Idler upon Town (1848). Here we meet the ‘West-End loungers’ and ‘Mooners’, who – like magpies – are captivated by the shiny displays of London shop windows, standing ‘riveted by the lollipops, oyster-shells, [and] rashers of saccharine bacon’. The ‘Street Boys’ were more troublesome, like mosquitoes ‘who sting and buzz about you, but are never to be caught’, shouting rude remarks to passing gentlemen and begging for coppers. Smith was rather more complimentary about the female of the species in The Natural History of the Ballet-Girl (1847). ‘We have disposed of The Vermin in the Gents. 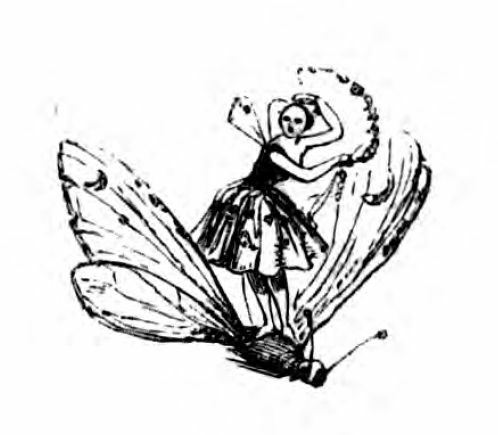 Let us hope in the Ballet-girl we may now take up a more agreeable subject – The Butterflies.’ The ballet-girl, like the butterfly, passes through several phases to become a ‘flying fairy’, working arduous hours and carrying out menial household tasks before reaching the glory of the stage. She is fond of finery and flowers, but also more basic delights: she ‘prefers stout to champagne’ and has ‘a great notion of coffee’. There is a folder in my desk-drawer at the moment, one of several containing the fruits of months of research into various aspects of nineteenth-century science and disease. This particular file, however, seems to increase in girth disproportionately quickly when compared to the others. Whenever I come across a page destined to be crammed into this ungainly, overstuffed behemoth, I can’t help but sigh and think again the same thought: my goodness, there are some loonies out there. This is the folder I use when I need to file something under Crackpots. Peeking from the top of my folder at the moment are some pages on the work of the German psychiatrist Johann Christian Reil, one of the most eminent medical scientists of his day, the founder of several medical journals, and the preferred physician of, amongst others, Goethe and Schilling, who in 1803 proposed the ‘music’ of a katzenclavier as an efficient means of arousing catatonic patients. 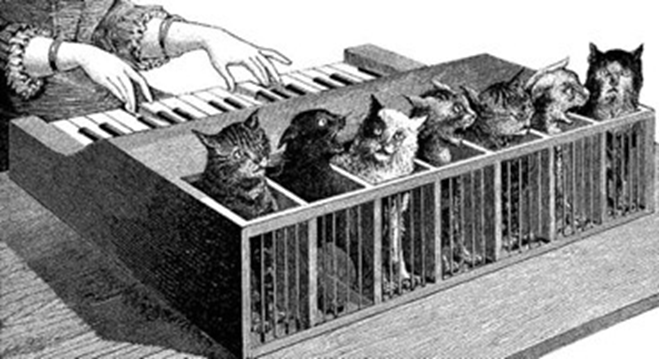 This instrument would be constructed by first determining the usual yowling pitch of a number of cats, lining them up accordingly, and then stretching out their tails over them a keyboard with a sharpened nail under each key. ‘A fugue played on this instrument… when the ill person is so placed that he cannot miss the expressions on their faces and the play of these animals,’ Reil believed, ‘must bring Lot’s wife herself from her fixed state into conscious awareness.’ All of a sudden, Monty Python’s Mouse Organ seems less preposterous. It has happened, though, that an initially bizarre notion has eventually been demonstrated to be in fact accurate. Ernst Chaldni, whose research into acoustic waves (mentioned in an earlier post) lead to major discoveries in the theory of sound, was also the first seriously to suggest the extra-terrestrial origin of meteorites. His claims were severely ridiculed on their first publication, only later to be proven right on the money. Beyond doubt, most other researchers in the history of science in any given period will have a similarly bulging, bemusing file tucked away somewhere like mine. Crackpottery is a long and rich tradition, and the difference between crackpot and genius is frequently only a matter of perspective. Galileo, Louis Pasteur, John Logie Baird, and Christian Doppler were regarded variously as charlatans, sorcerers, madmen, or incompetents before mainstream science caught up with them. When you think about it, it starts to seem like Crackpottery may be a vital part of discovery. Science is an essentially imaginative, creative undertaking, an endless sifting through of unknowable and un-provable possibilities in search of one genuine revelation. In these days of scarcity, as funding for research becomes progressively more difficult to come by, truly bonkers research is – for better or for worse – under threat. 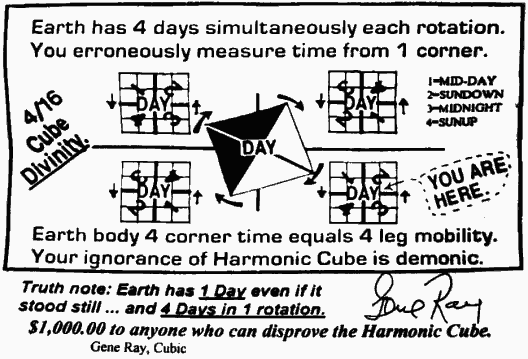 I almost feel sorry that no academic institution has yet decided to sink serious money into investigating Time Cube Theory, which, in a slight departure from more traditional ideas in physics, postulates that every day as we experience it is in fact four days occurring simultaneously. This hypothesis regularly tops lists of wacky pseudoscientific thought, edging out creationism, flat-earth theory, and homeopathy. Then again, isn’t it just possible that Lichtenthal was on to something after all? We now know that different ‘coloured’ noises – white noise, brown noise, pink noise – can produce distinct psychological effects. And isn’t it also possible that research into the psychic tuning has been conducted secretly by the CIA at Area 51 for years because they want to use it in warfare? Perhaps we should not be so quick to dismiss those revolutionary announcements that emerge from the fringes of science and research without first giving them due investigation. The vindicated crackpot may be rare, but not all crazy ideas are crazy. After all, flying machines, dark matter, and quasicrystals, and rocket-powered space ships were all reviled and fantastical daydreams in their time.